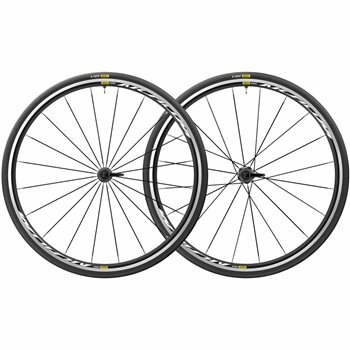 A great wheelset for four season riding, the Mavic Aksium Elites come supplied with 25mm Yksion Pro UST tyres and have a UST rim construction for easy conversion to a tubeless setup if you so wish. This wide rim will help smooth out rough roads, and the 25mm depth is versatile enough for climbing and sprinting performance alike. The steel spokes make for a stiff and strong build and lace the rim to a durable aluminium hub that features QRM sealed cartridge bearings. Hubs: Aluminium body, steel axle, sealed cartridge bearings, FTS-L steel freewheel. Rim construction: S6000 Aluminum / Brake track: UB Control. Recommended tyre size: 25 - 32mm. Maximum pressure tubeless: 25mm - 87 PSI, 28mm - 70 PSI / Maximum pressure tubetype: 25mm - 102 PSI, 28mm - 87 PSI. Spokes: Steel, straight pull, flat, double butted / lacing: radial front and rear non-drive side, crossed 2 rear drive side. Tyres: Yksion Pro UST, 700x28c, 11 Storm single compound, polyamide breaker. Weight: Front (without tyre) - 825 grams / rear (without tyre) - 955 / wheelset (without tyres) - 1780 grams. Compatibility: Quick release only / freewheel: Shimano/SRAM, convertible to Campagnolo with optional driver body. Maximum weight (including bike and rider): 120kg. Included: Aksium Elite UST Wheelset / Mavic Yksion Pro UST tyres, 25mm / tyre sealant syringe / Mavic tyre sealant (rear wheel) / tubeless rim tape / UST valve and accessories / user guide / BR101 quick releases. Mavic Aksium Elite UST Wheelset. Mavic Yksion Pro UST tyres, 25mm. Mavic tyre sealant (rear wheel).